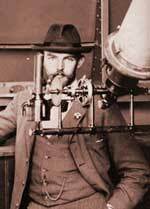 The Dutch astronomer Willem de Sitter around 1898. Never in all the history of science has there been a period when new theories and hypotheses arose, flourished, and were abandoned in so quick succession as in the last fifteen or twenty years. Looking back on the years of discovery and upheaval between 1915 and 1930, the Dutch astronomer Willem de Sitter rightly identified the period as perhaps the most extraordinary ever known to physical scientists. In the theories of relativity and the quantum, physicists starting with Albert Einstein had given entirely new and astounding explanations of energy, matter, gravity, even space and time. As astronomers tried to apply these new tools to cosmology, they were struck with their own revelations. As described on the previous page, Harlow Shapley's concept of the Big Galaxy was quickly followed by Edwin Hubble's proof of the existence of island universes. Stranger still, at the end of the 1920s came the realization that the universe is expanding. This realization came only after an uphill battle. In the early 20th century the common worldview held that the universe is static  more or less the same throughout eternity. Einstein expressed the general opinion in 1917 after de Sitter produced equations that could describe a universe that was expanding, a universe with a beginning. Einstein wrote him that "This circumstance irritates me." In another letter, Einstein added: "To admit such possibilities seems senseless." In his gravitational field equations, Einstein was just then providing a compact mathematical tool that could describe the general configuration of matter and space taking the universe as a whole. The peculiar curvature of space predicted in the equations was quickly endorsed in famous experiments, and by the early 1920s most leading scietists agreed that Einstein's field equations could make a foundation for cosmology. The only problem was that finding a solution to these simple equations  that is, producing a model of the universe  was a mathematical nightmare. I have erected but a lofty castle in the air... So let us be satisfied and not expect an answer, and rather see each other again as soon as possible! 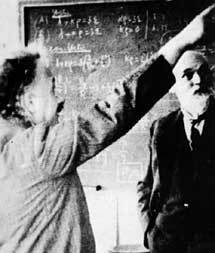 Albert Einstein (left) and Willem de Sitter (right) discussing at the blackboard de Sitter's theory of the expanding universe. 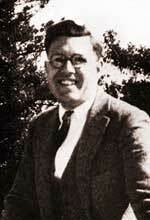 This picture was taken in 1932 at the California Institute of Technology. During 1916, in the middle of World War I, Einstein met with de Sitter in neutral Holland. Stimulating and criticizing each other, they produced two cosmological models, two different solutions to the field equations. But both models seemed to need special adjustments. De Sitter's model could be stable only if it contained no matter. De Sitter hoped the model might somehow be adjusted to describe the real universe, provided the density of matter was close enough to zero. The most striking thing about his empty universe was an odd effect on light  the farther one went from the mathematical center (the origin of coordinates), the slower the frequency of light vibrations. That meant that the farther away an object was in this odd universe, the more the light coming from it would seem to have a slowed-down frequency. Einstein's first try at a model likewise could not contain matter and be stable. For the equations showed that if the universe was static at the outset, the gravitational attraction of the matter would make it all collapse in upon itself. That seemed ridiculous, for there was no reason to suppose that space was so unstable. Einstein found he could stabilize his model by adding a simple constant term to the equations. If this constant was not zero, the model would not have to collapse under its own gravity. This "cosmological constant," Einstein admitted, was only "a hypothetical term." It was "not required by the theory as such nor did it seem natural from a theoretical point of view." In fact, "The term is necessary only for the purpose of making possible a quasi-static distribution of matter." The introduction of such a constant implies a considerable renunciation of the logical simplicity of the theory... Since I introduced this term, I had always a bad conscience... I am unable to believe that such an ugly thing should be realized in nature. The powerful belief in a static universe could only be overturned by the weight of accumulating observations. The first of these observations had already been reported in 1915. Probably the observation was unknown to Einstein when he was developing his theory and corresponding with de Sitter. World War I had disrupted communications between the English-speaking nations and Germany, where Einstein worked, while de Sitter had only a second-hand, incomplete report of the crucial observation. The observation had been made at the Lowell Observatory in Arizona. Its founder, Percival Lowell, suspected that spectral lines seen in the light from one species of nebula, the "planetary" nebulae, might also be found in the spectra of spiral nebulae. 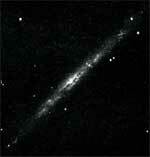 In 1909 Lowell asked his assistant Vesto Slipher to get spectra of spiral nebulae. Slipher initially doubted that it could be done. Then he realized that for nebulae with their extended surfaces, in contrast to the point images of stars, the critical instrumental factor was not telescope size (rival Lick Observatory in California had a much larger telescope) but camera "speed"  the exposure time needed to photograph spectra of nebulae. With a new camera, its speed increased by a factor of 30, on the night of 17 September 1912 Slipher obtained a spectrogram for the Andromeda Nebula. The spectrogram indicated that the nebula was approaching the solar system at an amazingly high velocity. 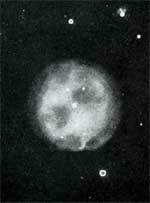 Slipher made more observations, exposing the same photographic plate over multiple nights (for example, 29, 30, and 31 December 1912). These yielded velocities averaging 300 km/sec. That was so large that some astronomers did not believe it possible. Over the next two years, Slipher measured velocities for other spiral nebulae. The first few measurements revealed approaching nebulae on the south side of our galaxy and receding nebulae on the opposite side. Slipher formed a "drift" hypothesis. 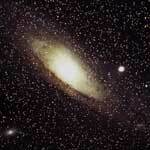 He thought that it was our galaxy that was moving relative to the nebulae, toward the south and away from the north. However, observations of more spirals contradicted this. Receding spirals were found on the south side of our galaxy as well as on the north side. Slipher nevertheless clung to his drift hypothesis. Perhaps more observations, he argued, would find at least a preponderance of approaching nebulae on the south side, toward which he thought our galaxy was moving. A different interpretation of the velocities seen in spiral nebulae soon turned up. De Sitter's model of a static universe had a diminishing frequency of light vibrations with increasing distance. Slipher had calculated velocities by using the rule that the frequency of light observed will change if the source of the light is moving rapidly away  but perhaps this was an illusion. Perhaps distant objects were not really receding at great speeds, but were only emitting a different frequency of light. Nothing like that happened in Einstein's model of a static universe, so Slipher's measurements might give a way to choose between the two models. World War I had slowed communications, but by 1921 de Sitter knew of Slipher's velocity measurements for 25 spiral nebulae. Only 3 were approaching. They could be explained away as the result of large velocities in random directions, superimposed on a much smaller systematic recession. Still, de Sitter hesitated to draw any conclusions. Velocities were known, but the other half of the predicted relation  the distances to the nebulae  were unknown. This crucial information would be developed by Edwin Hubble as he extended his measurements of "Island Universes" (described on the previous page). 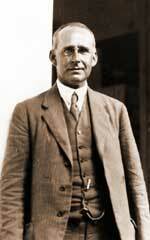 In 1928 Edwin Hubble attended a meeting of the International Astronomical Union, held that year in Holland. There Hubble discussed cosmological theories with de Sitter. Hubble returned to the Mount Wilson Observatory determined to test de Sitter's theory. 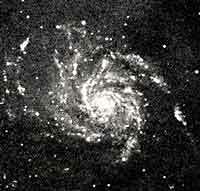 Hubble directed his assistant Milton Humason, a gifted and meticulous observer, to study faint nebulae, which would presumably be especially distant. Did the frequency of their light differ from the light coming from closer nebulae? Now, a slower frequency corresponds to a longer wavelength of light, that is, light closer to the red end of the spectrum. Thus what Hubble and Humason were seeking was a displacement of lines in the spectrum toward the red, what later came to be called a "red shift". Such a shift, Humason later explained, was what "might be expected on de Sitter's theory of curved space-time." Humason obtained velocities and Hubble obtained distances. They found a linear relationship  roughly speaking, the greater the receding velocity of a nebula, the farther the distance to it. Their data were skimpy, and the interpretation was shaky in detail. (Indeed it was later discovered that Hubble's distances to the nebulae were only half the actual distances.) Indeed his figures disagreed with what scientists already knew about the age of the universe. Nonetheless, the velocity-distance relation was a bold and brilliant extrapolation. The results establish a roughly linear relation between velocities and distance among nebulae. Not until the final paragraph of his 1929 paper did Hubble mention de Sitter, or indeed theory at all. And then Hubble simply noted that the velocity-distance relation might represent the de Sitter effect and might be of interest for cosmological discussion. 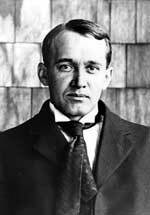 Hubble emphasized the empirical, observational aspect of his work. His chief goal was to convince skeptical readers that the velocity-distance relation really existed. 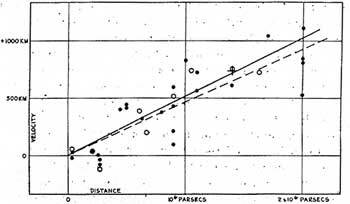 Hubble's 1929 velocity-distance relation for 46 nebulae. The black dots and the solid line represent the solution obtained from the 24 nebulae for which individual distances were determined, using them separately. Empty circles and the dashed line represent the solution obtained by combining the nebulae into groups. The cross represents the mean velocity for a set of 22 nebulae whose distances could not be estimated individually. There is more to the advance of science than new observations and new theories. Ultimately, people must be persuaded. In science, as in a court of law, advocates for each side of an issue present the best case possible in an attempt to reach the truth. A heroic image of pristine science may exclude the use of rhetorical skills. Advocacy, however, is an integral part of real science. There can be no judgment until the arguments are laid out clearly and energetically. Meanwhile Hubble carried on a scientific campaign to pin down the velocity-distance relation beyond question with improved observations . concerning the redshift of light in distant nebulae make the presumptions near that the general structure of the Universe is not static. Hubble's undeniable observations that the light from nebulae showed a red shift increasing with distance ruled out the possibility that Einstein's static model represented the real universe. De Sitter's alternative static model, without matter, was also ruled out by new observations. De Sitter had supposed that the density of matter in the universe might be close enough to zero so that his model could work. A new estimate, in 1927, of the mass of our galaxy caused de Sitter to reexamine this assumption and reject it. There could be no more pretense that de Sitter's model might correspond to reality. Einstein too soon acknowledged that the red shift overthrew the old assumption of a static universe. At a meeting in London of the Royal Astronomical Society early in 1930, de Sitter admitted that neither his nor Einstein's solution to the field equations could represent the observed universe. The English astronomer Arthur Eddington next raised "one puzzling question." Why should there be only these two solutions? Answering his own question, Eddington supposed that the trouble was that people had only looked for static solutions. the true solution represented in nature must be a dynamical solution. In fact a few astronomers had been looking for other solutions to Einstein's equations. Back in 1922, the Russian meteorologist andmathematician Alexander Friedmann had published a set of possible mathematical solutions that gave a non-static universe. Einstein noted that this model was indeed a mathematically possible solution to the field equations. Later, Friedmann would be hailed as an example of great Soviet science. But through the 1920s, neither Einstein nor anyone else took any interest in Friedmann's work, which seemed merely an abstract theoretical curiosity. Most astronomers continued to take it for granted that the real universe was static. When Friedmann published again in 1924, the paper, seen as a matter of pure relativity theory with no astronomical interest, was omitted from the annual survey of scientific papers on astronomical topics. He could not stand up for his ideas, for a year later he died of typhoid fever, only 37 years old. 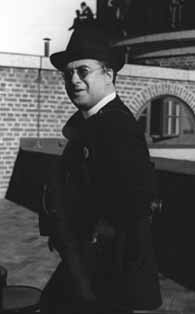 The Belgian astrophysicist Georges Lemaître had also published a model of an expanding universe, in 1927. Lemaître was a Catholic priest (from 1960 until his death in 1966 he was president of the Pontifical Academy of Sciences). His contribution to science is now celebrated, but at the time it made no impression. Published in the little-read Annals of the Brussels Scientific Society, it was easily overlooked. Those (including Eddington) who did read Lemaître's 1927 paper had promptly forgotten it. I have found the true solution, or at least a possible solution, which must be somewhere near the truth, in a paper... by Lemaître... which had escaped my notice at the time. which had escaped my notice at the time." 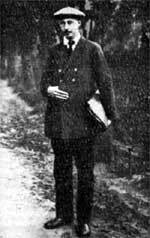 Einstein soon confirmed that Lemaître's work "fits well into the general theory of relativity." In 1931 de Sitter publicly praised Lemaître's "brilliant discovery, the expanding universe'." In that same year, Lemaître went on to propose that the present universe is the "ashes and smoke of bright but very rapid fireworks." We can now see this "fireworks theory" (as it came to be called) as a first version of the "Big Bang" theory of the origin of the universe. What did it mean, that strange new phrase, expanding universe? It meant that the light from distant nebulae was red-shifted not from some peculiar de Sitter effect, but because the nebulae were actually moving away from us. This was not because there is anything special about us  by now astronomers understood that the nebulae are galaxies more or less like our own. Each of these galaxies was moving away from all the other galaxies. Space itself was expanding between them. There was no special point somewhere among the stars where the great expansion had startedwe and all other galaxies are inside that place. Thus the farther any two galaxies were apart, the faster they continued to separatewhich was precisely Hubble's velocity-distance relation. Cosmologists recognized at once that an expanding universe means that in the far future the galaxies will be spread much farther apart. Looking back, long ago the universe must have been far denser. Did time itself have a beginning? Hubble's few measurements were enough to persuade the world's best scientists to take up a radically new view of the nature, the origin, and the fate of the universe. Perhaps scientists could take up this view so quickly because quantum and relativity theory had prepared them for remarkable revelations. The recognition that the universe is expanding was no less revolutionary  the culmination of a truly exceptional period in the history of science. The expansion of the universe is now seen as one of the great scientific discoveries, and Hubble generally gets the credit. More precisely, however, Hubble established an empirical formula that led the great majority of scentists to believe in the expansion. It is an open historical and philosophical question in what sense Hubble's correlation of data was a "discovery," and exactly how the claim that the universe is expanding grew in scientists' minds. Many observations have confirmed the model of an expanding universe that Hubble's relationship validated. But Hubble should not be judged simply by which of his conclusions are now believed to be correct. More important was the direction he pointed out: using galaxies as a key to cosmic history. Hubble's work should be appreciated for the assumptions it overthrew, and for the vistas it opened, as a landmark accomplishment of human intellect.